Read an excerpt below from Leading Age's article in which Felecia Sveda, VP of Hospitality Services at Lenbrook discusses the achievements of Michael Halpern, Lenbrook Resident and recipient of the Positive Aging Icon Award. 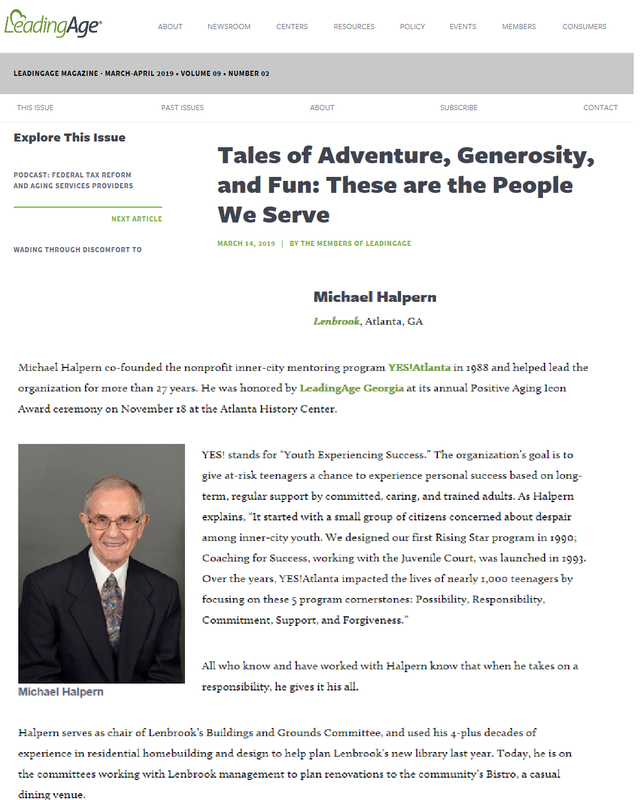 Michael Halpern co-founded the nonprofit inner-city mentoring program Yes! Atlanta in 1988 and helped lead the organization for more than 27 years. He was honored by Leading Age Georgia at its annual Positive Aging Icon Award ceremony on November 18 at the Atlanta History Center. All who know and have worked with Halpern know that when he takes on a responsibility, he gives it his all. Halpern serves as chair of Lenbrook’s Buildings and Grounds Committee, and used his 4-plus decades of experience in residential homebuilding and design to help plan Lenbrook’s new library last year. Today, he is on the committees working with Lenbrook management to plan renovations to the community’s Bistro, a casual dining venue.